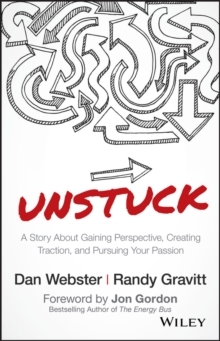 Untwist the question mark from your life to start living authentically UNSTUCK offers a path forward for those who are "stuck" despite the comfort, security, and what should feel like success. Do you feel disengaged from a life that looks good on paper? Do you feel like there must be something more? This is your guide to getting unstuck, breaking free of your comfortable cocoon, and discovering what you are meant to be. Through the story of George Johnson, a man in a position much like yourself, you'll learn how to shed the boredom, emptiness, and confusion so you can get on with your life. Whether you need a complete overhaul or just a jumpstart, you'll find the advice you need to start making it happen. More than just a story, this book shifts your perspective to help you realistically plan a transition from the ordinary present to the extraordinary future; emotional support coupled with practical guidance helps you find your path, identify your destination, and begin your journey. * Re-think your purpose in life and discover your calling * Rediscover the truth about yourself and who you really want to be * Follow a clear formula for moving forward with authenticity * Break out of your comfort zone and feel fully alive The fact that you've succeeded doesn't mean that you can never change; your dedication, commitment, and skills got you this far imagine what they could do with a healthy dose of passion! You Unstuck re-acquaints you with your authentic self, helps you uncover your passion, and guides you toward your next big thing.